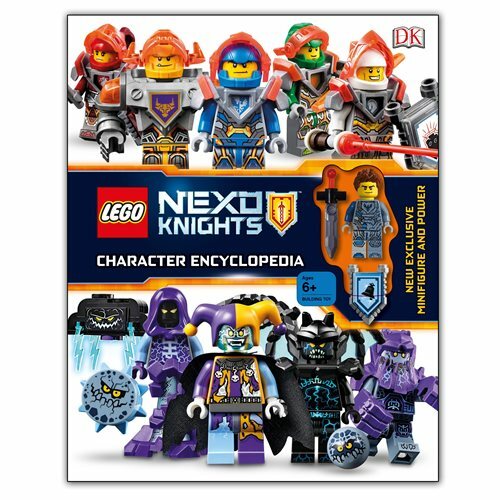 The LEGO Nexo Knights Character Encyclopedia Hardcover Book features all the popular characters from the LEGO Nexo Knights toys, games, and television show. Meet the knights - Clay, Lance, Macy, Aaron and Axl - and all the foes they face in the magical land of Knighton. This ultimate guide features all the mini-figures and sets from the 2016 and the 2017 Nexo Knights story lines, plus the awesome NEXO Powers. The character encyclopedia format displays every Nexo Knight character, and is enhanced with additional content on the knight's vehicles and scannable Nexo Powers. The LEGO Nexo Knights Character Encyclopedia Hardcover Book includes a exclusive mini-figure and power. The 176 page book measures about 9 2/5-inches tall x 7 2/5-inches wide. Ages 6 and up.